The show, the second in a series presented by the Boston Center for the Arts’s Mills Gallery highlighting contemporary art trends through the work of emerging artists in the Northeast, takes a square look at how today’s sculpture is at the service of a larger idea. It no longer stands alone on a plinth. It incorporates performance art; it sidles toward painting. It may even text you. Refreshing and robust, “Space and Intimacy” examines how contemporary art shatters boundaries, and not just those between mediums — sometimes it pushes at the edge between viewer and art. Artist Coe Lapossy spends every day in the gallery, working on her charming installation/performance “Meg/Sydney/Alec,” which hinges on paint as a 3-D medium. The title refers to actors in the 1992 movie “Prelude to a Kiss,” a romantic fable about body swapping, just as the work swaps painting for sculpture. 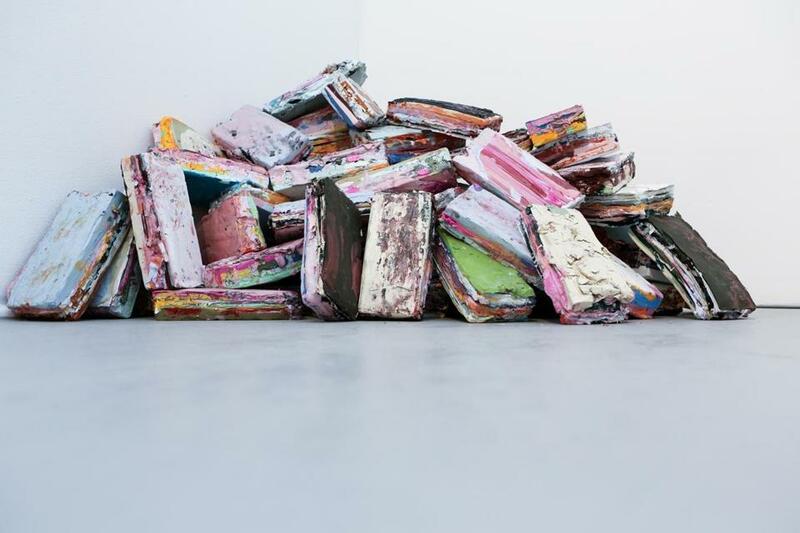 She has already made dozens of bricks of dried paint; now she layers them in a casket reminiscent of Donald Judd boxes, fixing them together with more paint. On March 12, during a day of performances, Lapossy will saw the box open, like a magician sawing an assistant in half. The solid paint inside will be sawed into bricks again, and laid inside a chamber a viewer must crawl to enter. (Dress accordingly.) If you stop by, Lapossy will give you a number to text so that you can receive videos of the paint bricks, animated and speaking lines from the movie. It’s entertaining and smart, but all this interaction can preclude contemplation. Other works offer that. Steven Pestana employs classical and other historic references to take the measure of humanity in relation to the cosmos, inevitably folding in meditations on mortality. For “The Epitome Theater,” he places the shell of a man, gold leaf inside and gunmetal gray outside, on a bed of snow quartz on a table. A heap of coal, ornamented by a brass pyramid, litters the floor. It’s a somber, glowing piece, redolent of alchemy and ritual, laden with systems of knowledge. As is Johnny Adimando’s “Night Carriers IV: Dredging of the Acolytes,” a miraculous paper construction of a body, viscera emerging in a series of convolutions, and printed with diagrams and symbols. Encoded and labyrinthine, the piece, with its splayed figure, still feels like an open book, emotionally raw. Adimando will also perform on March 12, as will J.R. Uretsky, a performance artist puppeteer, who tends to sweetly, awkwardly subvert propriety. The dancer in John Singer Sargent’s “El Jaleo” inspired Samantha Fields’s resplendent, daunting, vaguely figural fiber piece, “Lady of Leisure,” made from found afghans, beads, and more. This lady has the same bold flounce as the dancer, but her hair stretches in taut stitches against one wall, and her palette is glitzy, neon, 1970s. She takes up space, and dares you to judge her. AJ Liberto’s works set precariousness against sheen. “The Sky Opened and Swallowed Our Lands, Followed by Calamitous Efforts to Rebuild” sets a barely held together teetering tower on a mattress, which in turn sits atop a sleek, white, modernist table. It can’t last, the work seems to say, so don’t idolize it. And yet we so often do. “Space and Intimacy” feels urgent and alive. Curator and artists seem to know they’re crafting for this moment, and not for the ages. Enjoy it while it lasts. Ursula Von Rydingsvard’s “Crossed Mirage III,” the latest in Barbara Krakow Gallery’s “One Wall, One Work” series, is small for this sculptor, who tends to work on a grand scale. She has made a wall of 4-by-4 cedar beams and carved along one face, crafting earthy protrusions and recesses, incising the wood and shading it with charcoal. It unfolds along a grid drawn by the edges of the beams: At the top the carvings are smaller, the rhythm faster, and below it swells open, like panicked breathing slowing to deep calm. In a strong complement to Von Rydingsvard, Krakow has installed a series of Brice Marden prints, made from 1986 to 1998. The looping calligraphies inscribed against loose grids recall Von Rydingsvard’s tempo; the dollops and skeins of ink echo to uneven darkness and precise lines in her carvings. Also at Krakow, and completely different, see Cornelia Parker’s “Thirty Pieces of Silver (Exposed).” Parker famously once had a steamroller run over silver valuables, and called the resulting installation “Thirty Pieces of Silver.” For this work, she found glass negatives depicting antique silver photographed for a 1960s auction catalog and written over with notations. She printed them, still in their glassine sleeves, as photogravures, so the images remain negative. What’s broken in “Broken Jug” is the negative itself, so the shadowy jug appears to perch on a pale hill, like a monument. Tape on the sleeve casts a vertical shadow down the image. These are ghostly images, rife with marks and cracks, looking like photo/drawing hybrids while maintaining the whiff of silver’s value. At: Barbara Krakow Gallery, 10 Newbury St., through March 12.